#AskSean: Is the NEW Cradle Course at Pinehurst Resort REALLY that good? October 15th, 2017 #AskSean: Is the NEW Cradle Course at Pinehurst Resort REALLY that good? 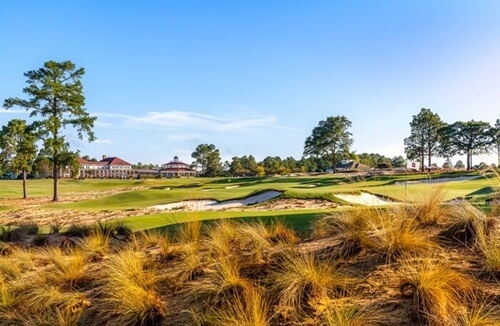 The long and short of it, YES, The Cradle Course is a must play for all golfers venturing to Pinehurst Resort. In fact, it's also a great spot for golfers heading to the area yet not staying at the resort itself - tee times can be booked 24-hours in advance for non-guests. Although I have not personally played it, the pictures tell me everything I need to know, and quite honestly, I can't think of a better way of finishing off a day of golf with your buddies than having some fun on the short course. 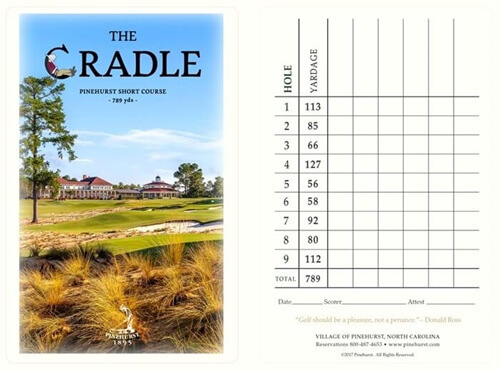 The Cradle Course - a 9-hole par-3 course playing 789 yards, is both a fun and challenging little test of golf. With the shortest hole playing 56-yards and the longest playing at 127-yards, this is the perfect setting for grabbing a few golf clubs and testing your short game, and of course, perhaps, for some of us, getting as close to shooting a course record that we ever will in our golfing lives! To date, it's been set by Matt Oshrine - an aspiring professional soon to be cutting his teeth on the Web.com Tour, who just a few short days after opening, shot a record score of 21! Since its grand opening on September 30th, 2017, we have had a few groups stay at Pinehurst Resort that have played it and have absolutely loved it! As mentioned earlier it's the perfect addition to any part of your Pinehurst Resort golf vacation. Designed by Gil Hanse - The mastermind behind the Olympic Course in Brazil and currently renovating Pinehurst No. 4 - he incorporates the natural lay of the land which is unique to the origins of Pinehurst Resort. The green settings blend in beautifully to the natural landscape and are protected by rustic bunkering, which is a trademark of Pinehurst golf. Adding to the prestige of The Cradle Course is the expansion of the putting course - Thistle Dhu. The new Thistle Dhu Putting Course is four times larger than the original putting course, measuring at 75,000 sq. ft. The expansive putting surface will get your putting game geared up for play on The Cradle Course, as well as any of the other Pinehurst golf courses. The rolling hills and massive undulations are the definite recipe to enjoyment for all golfers. A $50 Green Fee That Can't Be Beat! Green fees, to date, for The Cradle Course are $50 per golfer, and will likely vary by season. Kids, 17 and under, when accompanied by a paying adult play FREE! And resort guests can book tee times in advance, while the general public can book tee times 24-hours in advance. With all of our Pinehurst Resort golf packages we now make it a priority to include a suggestion for a round on The Cradle Short Course. Quite simply, we strongly believe that any golfers making their way to Pinehurst Resort will only get a better overall experience if it's included in their golf itinerary. And for the low green fee, the return on enjoyment far exceeds how you'd spend that $50 anywhere else . . . Well maybe with the exception on the patio of The Deuce behind the 18th green of No. 2! Are you ready for your personalized Pinehurst golf vacation? Contact us today! We're always willing and more than happy to help create a memorable golf vacation.